I’m back in the YA universe it seems. 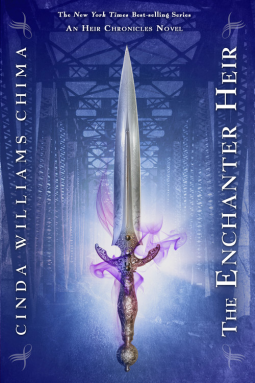 I was re-reading HP this summer and now I read The Enchanter Heir so it seems my feet are firmly back on the YA road. Ok, I’ve been reading some other stuff but nothing as much as these. I admit I almost stopped reading this book, since in the beginning I had a problem getting into the story. A new world with different types of let’s call them “gifted” people with their words for everything and no explanation forthcoming for a while. It all got explained eventually and it’s possible other readers might not have this particular problem as it seems there are other books in the series. Unlucky for me though, those books are single ones. This one isn’t. So I’m back to my standard pet peeve. I really hate it when a good book ends up nowhere and you have to wait for the sequel which never comes out in a month. What’s wrong with writing a longer book?! I mean, I know what’s wrong with that – you only get paid for the one book then. But that is not a question for this post. Of course I wouldn’t get so upset over it if I didn’t enjoy the book so much. “They called it the Thorn Hill Massacre-the brutal attack on a once-thriving Weir community. Though Jonah Kinlock lived through it, he did not emerge unscathed: like the other survivors Jonah possesses unique magical gifts that set him apart from members of the mainline guilds. At seventeen, Jonah has become the deadliest assassin in Nightshade, a network that hunts the undead. Emma Claire Greenwood grew up worlds away, raised by a grandfather who taught her music rather than magic. An unschooled wild child, she runs the streets until the night she finds her grandfather dying, gripping a note warning Emma that she might be in danger. The clue he leaves behind leads Emma into Jonah’s life-and a shared legacy of secrets and lingering questions. Was Thorn Hill really a peaceful commune? Or was it, as the Wizard Guild claims, a hotbed of underguild terrorists? The Wizards’ suspicions grow when members of the mainline guilds start turning up dead. They blame Nightshade, bringing tensions between the groups to a head.